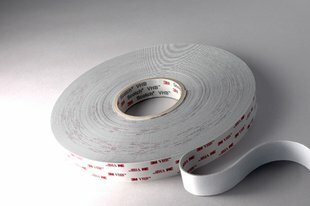 3M VHB™ Tape 4622 is a conformable, double-sided, pressure-sensitive, closed-cell acrylic foam tape with a PE film liner. It can replace rivets, welds and screws. It offers design flexibility with its viscoelasticity and powerful ability to bond to a variety of surfaces. 45 mil thick. Bonds high (face side) and high/medium (liner side) surface energy substrates. Provides handling convenience, cushioning, damping, and impact resistance.